Seoul Old Towns or New Human Towns? New City Hall or Tsunamheat Wave? In the classic New Town model, you annihilate a whole neighborhood, and you replace it with a block of aseptic tombstone buildings. In the "Human Town" concept*, you promote a more sustainable redevelopment which preserves the structure (buildings and streets), improves the infrastructure (streets and parkings in particular), adds community services, and plants a few CCTVs (This is Korea: Hyeong is watching you). As expected, PARK Won-soon decided to prolong OH Se-hoon's project for lack of an alternative in the short term**, but politically, he had to rebrand it. So goodbye "Human Town", here comes the "Old Town" concept. If the name does celebrate the end of the New Town model, it may sound a bit confusing since we're talking about dwellings often built in the 1980s and even later... and rather the quick-and-dirty way: in general, a 'dandok jutaek' (단독주택 / single family house) is transformed into a 'villa' (imagine a no-frill 3-story condo, not the lavish Bill Gates mansion), or worse, a 'one-room' farm (generally a cheap rabbit hutch for poor students). But who cares about appellations? The important thing is to save urban systems before it's too late: speculation makes it much easier to build from scratch a "Greenfield New Town" in the countryside than to invest in downtown renovation***. Urbanism is never a zero-sum game, particularly considering Korean demographics, and "build it and they'll come" often means "build it and they'll leave a place that deserves some attention as well". Take Incheon, for instance: Songdo can work, and even Cheongna can make it, but downtown Incheon has been totally discarded, and if you use public transportations it often takes less time to reach Seoul than to go from one neighborhood to another within the old town.
. In Dobong-dong (Dobong-gu): the 43,000 square meter block (around 280 beonji) lies between Dobongsan Station and the mountain with its national park, so it will follow a 'mixed tourism and residential' theme.
. In Daerim-dong (Yeongdeungpo-gu): the 40,000 sqm block is located in a neighborhood with a significant Chinese minority (around 1027 beonji, near Daerim Station and Daerimcheon), and Seoul city decided to focus on the 'multicultural residence' dimension.
. Siheung-3-dong, in the southwestern corner of Geumcheon-gu, next to Gwangmyeon, and Ansan): a low-rise pocket near relatively recent bed towns, at the feet of Hoamsan, a western branch of Gwanaksan.
. Eungam-dong, Eunpyeong-gu: a New Town recently popped up in the neighborhood, unfortunately against Bukhansan. This administration seems to be pushing harder than their predecessors. I hope not too hard: you wouldn't want forsaken residential neighborhoods to become kitsch theme parks. Now there are a couple of projects I think OH Se-hoon pushed too hard. Today, I won't mention the embarrassing floating islands again (oops, I just did), but Yoo Kerl's new Seoul City Hall. Ever since I saw the model four years ago I've raised more than a few doubts about the design of this "tsunami". I don't mean the concept in general (I wanted Seoul to keep elements from the old building, and to open up the place as a keystone and crossing point), but the design of the fakely organic shell, which I found not only obsolete and disgraceful (even more now that the final coating is visible), but even offensive: coming up with this, 3-4 years after the big Asian tsunami... Note that someone did even worse later: a twin project in Yongsan reminiscent of 9/11, with some kind of an explosion / cloud connecting both buildings in their midsections. I didn't quite believe in the 'environmental-friendly' pitch either. To me, it was a bit like with the glass pyramid in the Louvres museum: the most important part of the renovation was the new system underground, but everybody focused on the tip of the iceberg, this small triangle. And everybody was criticizing architect I. M. Pei because the modern structure was denaturing the old palace, but I was more worried about the greenhouse effect and the heat visitors would feel inside. I would have bet a buck on some similar fate for the new Seoul plaza land(water)mark. Look at what happened to Yongsan-gu Office! A perfect example of architectural extravaganza designed for a Korean local administration at the peak of the bubble years, this abomination becomes an oven as soon as the sun strikes. Well this morning, I'm eating my hat on that one. 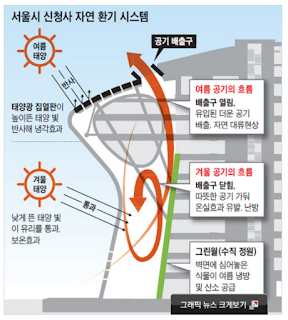 The Chosun Daily revealed that one month ahead of the inauguration and without air conditionning, the building was 6 degrees cooler than outside (31 vs 37 Celsius). There's a green wall inside, and the outer shell has three layers, including a special glass: very thick and coated with a special metal film, it blocks four times more infrared rays. The wave structure creates a natural air cycle, and the hottest parts escape from the building, near the top (see this "Architectural Redigest" graph in their link****). 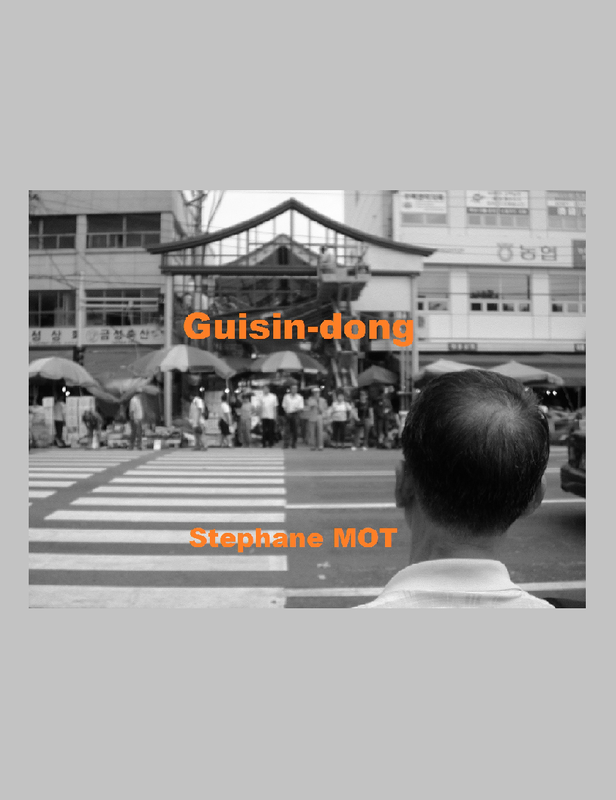 * "OH Se-hoon launches the "Seoul Human Town" concept"
*** see the 'About New Towns and the laws of gravitation' part of "Wet eyes for wetlands and urban mirages" **** "내달 입주하는 서울시 새청사… 에어컨 안 켜고 온도 측정해보니… 유리찜통인 줄 알았는데 바깥보다 6도 낮았다"